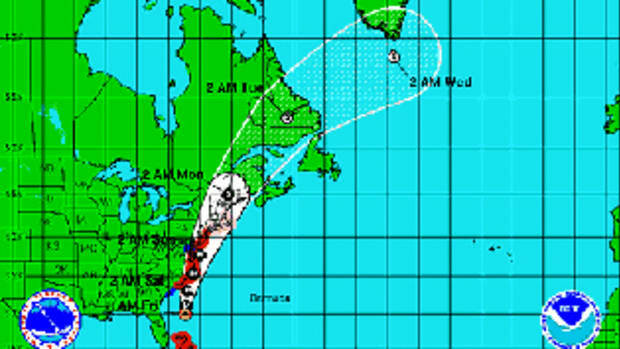 Irene has weakened further and is now a tropical storm as it makes its way through New England. As a Category 1 hurricane, Irene made landfall around Little Egg Inlet, N.J., around 5:35 a.m., with winds near 75 miles per hour. Hurricane Irene made its first landfall near Cape Lookout, N.C., just before 8 a.m. Saturday. After lumbering through the Outer Banks of North Carolina, Irene left a wake of boats strewn about the shore and in wooded areas, according to Capt. Lee Sykes, franchise owner of TowBoatUS Oregon Inlet (N.C.). "That&apos;s what everyone is telling us – we are in no hurry [for salvage]. We&apos;re in the woods, so we ain&apos;t going anywhere." Sykes said a representative from an insurance company told him she had received 3,000 claims already from boat owners. As Sykes had predicted (see the Aug. 27 Dispatches report), the backside of the storm caused the most damage to the Beaufort, N.C., area. "A lot of the docks are gone – the floating docks didn&apos;t make it. The marinas were cleared out – boaters had to haul or move their boats." 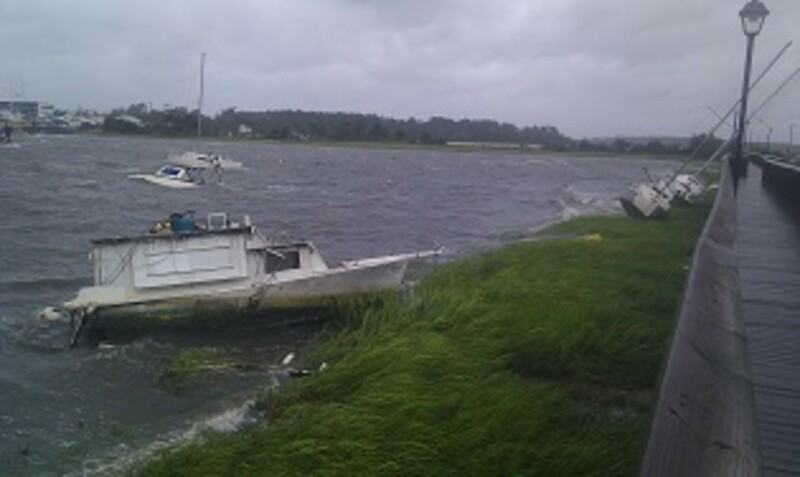 Click play to watch a video of a boat in North Carolina being ripped off its mooring by Irene. Up the coast in New Jersey, the boats and marinas in Cape May faired very well, Sea Tow franchise (Sea Isle/Cape May) owner Capt. Jack Moran says. to editorial@soundingspub.com. However, please do not put yourself in danger. "I&apos;ve been out since first light," he said at about 8 a.m. "We have very little damage – almost none at the marinas. All the marinas in town look good. There are some trees down, but we still have power. It doesn&apos;t look like any work for us has come in yet, but it&apos;s still early. We&apos;ll have sinkers." Moran said the storm surge was not a problem. Winds were about 35 to 40 mph with gusts up to 50 mph, he said. "I don&apos;t think we hit 70 mph winds," says Moran. The boating community did a good job preparing for the storm, says Moran. Some boaters who chose to outrun the storm or ride it out ran into trouble. A couple attempting to outrun Hurricane Irene were rescued Saturday in Chesapeake Bay as their sailboat was battered by 6- to 8-foot seas and winds gusting to 45 mph, according a Virginian-Pilot article posted online. 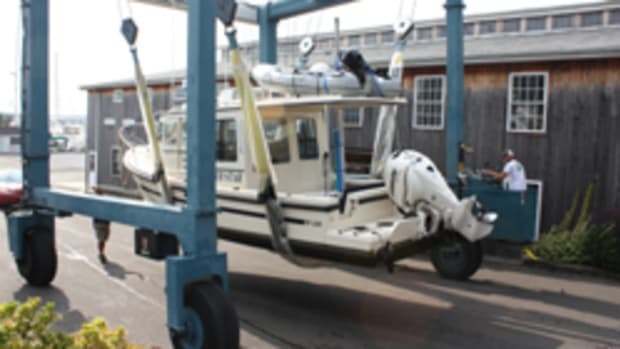 Unable to launch rescue craft, two rescue crewmembers swam to the sailboat, pulled the sailors off and hauled them back to shore in the Willoughby section of Norfolk near the mouth of Chesapeake Bay, the article said. The sailboat had served as their home, Capt. Mike Marsala of Norfolk Fire and Rescue said. The storm at 9 a.m. was still moving through the Mid-Atlantic and is predicted to pass through New York and New England today. Meteorologist say it continues to pose a serious threat to the eastern Mid-Atlantic, eastern New York and all New England with flooding rains, coastal flooding, and strong winds. Hurricane warnings were in effect from Chincoteague, Virginia, north to Sagamore Beach, Massachusetts: this includes Delaware Bay, New York City, Philadelphia, Long Island, Long Island Sound, coastal parts of Connecticut and Rhode Island, Block Island, Martha&apos;s Vineyard, and Nantucket.